At Avengers Mansion, Thor and Nova are talking to three young women with most of their attention being given to the God of Thunder. Richard Rider asks the ladies why they are so interested in his teammate. The women explain that, besides having obvious good looks, Thor is an immortal and must have seen some of history's greatest events and people. As the golden-haired Avengers begins to tell one of his stories, Nova does a cannonball dive into the pool next to them. The splash hits Thor in the back! Rich tries to explain that he was pretending he was a pirate walking the plank. The mention of pirates causes the Son of Odin to begin a new story about his pirate days. He explains that, long ago, an old foe named the Executioner had led an invasion of creatures into Asgard. Thor and his fellow Asgardians battled back. However, both Thor and the Executioner were thrown off Asgard's Rainbow Bridge and fell into Earth's ocean. The Thunder God was rescued by a group of pirates. The Excutioner was also found be a different group of humans at sea. On the ship, Thor finds that the pirates have taken an innocent woman hostage and tied her to the front of the ship. The Avenger frees her and ties the captain to the ship! On the other pirate ship, the Executioner also has a brief battle with its crew and quickly takes command of the ship and crew. Meanwhile, Nova goes over to Susan Storm and asks her if she thinks the story is true. Sue believes the tale as Nova feels its hard to compete with a man who has a day of the week named after him (Thursday). Rich comments that all he has is a sandwich named after him at Gordman's Deli and it has sauerkraut. The human rocket wanders over to Natasha Romanov and asks her what she is doing. The Black Widow replies that she is looking at a disseration by Reed Richards on the use of tachyons to penetrate time. Nova decides to go back to listening to Thor's story. Thor has been telling the women how he had given aid to the girl he had rescued. He explains how he had made a meal, created a rain shower and provided safe travel to land for her. Once she was safely back in her village, the townspeople gave Thor a great party in appreciation. Suddenly, the town is attacked by cannon fire launched by the Executioner and his pirate gang. The immortal hero uses his hammer to return the cannonballs at high speed. As the pirates try to run for cover, Thor unleashes powerful bolts of lightning down onto their ship. The pirates and their leader swim their way to land where Thor and the Executioner prepare to face each other in single combat. They agree that the winner will gain the village. 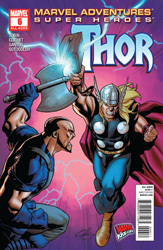 Thor quickly delivers a powerful hit on the Executioner with his hammer. He then smashes his foe's face into the ground and throws him through a tree. Thor ends the battle by tossing the villain out into the ocean! Following the story, Nova and the Invisible Woman wonder if Thor might be exaggerating his tale. The Asgardian opens a dimensional portal with his hammer for the young women and his fellow Avengers to walk through. The group arrives at the current location of where Thor's story took place three hundred years ago. They are immediately greeted by the city's residents and warmly welcomed. One of the citizens confirms to Nova that Thor had saved their village centuries ago from the Executioner and his pirates. In gratitude, the village had renamed itself Mjolnir (the name of Thor's hammer) along with creating a beautiful statue. Thirty minutes later, the three Avengers are walking through Mjolnir when they overhear a group of men talking near the ocean. Thor immediately recognizes the Executioner's voice and they proceed to confront him and his new gang of thieves. The immortal villain is shocked to see Thor and a battle begins for the fate of the city! While Thor and the Executioner fight, the Invisible Woman and Nova uses their powers to quickly knock the thieves unconscious. Meanwhile, Thor finds himself being battered by his foe and eventually thrown to the ground. Suddenly, the Son of Odin stands and uses the Executioner's own statue to smash him back into the ocean! Thirty minutes later, Nova and Sue Storm are having drinks at one of Mjolnir's local cafes. Richard Rider asks Sue for her honest opinion. He wants to know if she thinks he should grown his hair long like Thor so he can be popular with the ladies.